16th century, Tibet, Tsang Nyon Heruka, copper alloy, private collection, photo on Artnet http://www.artnet.com/artists/a-bronze-figure-of-tsangny%C3%B6n-heruka-1452-1507-c-wrWgfG9RNl48omA0oiFZFQ2. Depicted with a mahasiddha appearance, his hair gathered in a voluminous top knot, the famous Tibetan master is seated with his legs locked, on a lotus base covered with a tiger skin, brandishing a vajra sceptre and holding a vase of longevity before him. He is adorned with the spirals-shaped shell earrings often seen on such figures, together with bone accessories including a cross-belt. A small staff rests against his left arm. 15th-16th century, Tibet, Tsang Nyon Heruka, bronze (copper alloy), private collection, photo by Ravenel . A rare image of him seated on a human victim over the tiger skin. His long braids of hair are arranged in a spectacular and distinctive bun that stands on his head. 16th century, Tibet, Tsang Nyon Heruka, copper alloy, private collection, photo by Pundole’s. Seated at ease, holding the vajra sceptre above his raised knee, adorned with princely jewellery and a skull tiara tied at the back. His topknot is covered with a net made of bone beads and a half-vajra finial, the rest of his hair is held in place with a scarf decorated with a floral print. 15th century, Tibet, Tsang Nyon Heruka, copper alloy and gems, at the Virginia Museum of Fine Arts (USA) https://www.vmfa.museum/piction/6027262-8171006/. Originally labelled ’17th century mahasiddha’ by the museum and published as such in a previous post, this sculpture of the ‘Madman of Tsang’ shows him coiffed with a similar bone net over his topknot and a human hide over his shoulders. 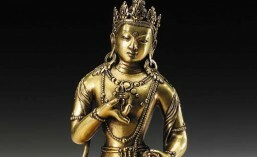 Late 15th century, Tibet, labelled ‘Mahasiddha’, bronze, private collection, photo by Christie’s https://www.christies.com/lotfinder/Lot/statue-de-mahasiddha-pharkontshanraschen-en-bronze-tibet-6007962-details.aspx. The same applies to this sculpture, with an inscription on the back that says ‘Pha.rkon.tshan.ras.chen’, previously published in the mahasiddha section of the blog. He has a (barely visible) vajra sceptre in his right hand. It is unusual for him to hold a vajra bell in his left hand. Undated (15th/16th century), Tibet, Tsang Nyon Heruka, (copper alloy and silver inlay), private collection, photo on Himalayan Art Resources https://www.himalayanart.org/items/44487. Another example of him holding a vajra bell in his left hand. 16th century, Tibet, Tsang Nyon Heruka, bronze (copper alloy) with silver-inlaid eyes and copper-inlaid lips, private collection, photo by Christie’s https://www.christies.com/SaleLanding/index.aspx?intsaleid=27735&lid=1&saletitle=&pg=all&action=paging&sid=cf214987-11b1-4ee4-a7b3-eadaf7b18ad6. Here he wears a floral tiara and matching garland, an anti-caste symbol often worn by mahasiddhas. This entry was posted in Historical people, Tibet, Tsang Nyon Heruka and tagged 15th century, 16th century, Asian art, brass, bronze, buddhist, Himalayan, lama, sculpture, statue, Tibet, Tibetan, Tsang Nyon Heruka. Bookmark the permalink.